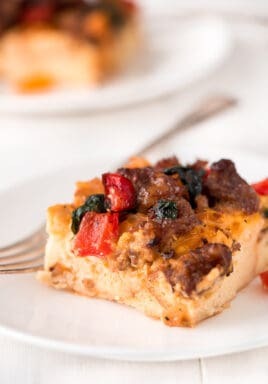 Prep this Egg and Sausage Breakfast Casserole at night and wake up to a delicious and filling savory breakfast that the whole family will enjoy. I’m more of a sweet breakfast loving girl. 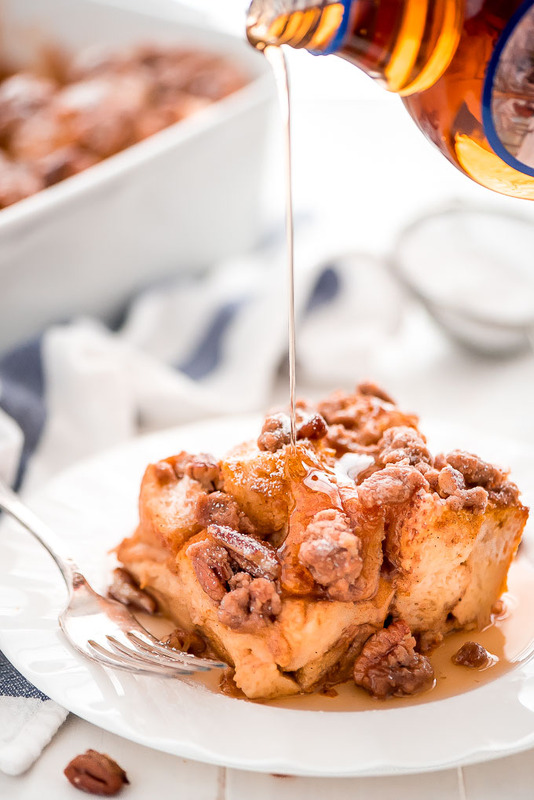 Gimme Cinnamon Rolls or really anything with Buttermilk Syrup and I am good! 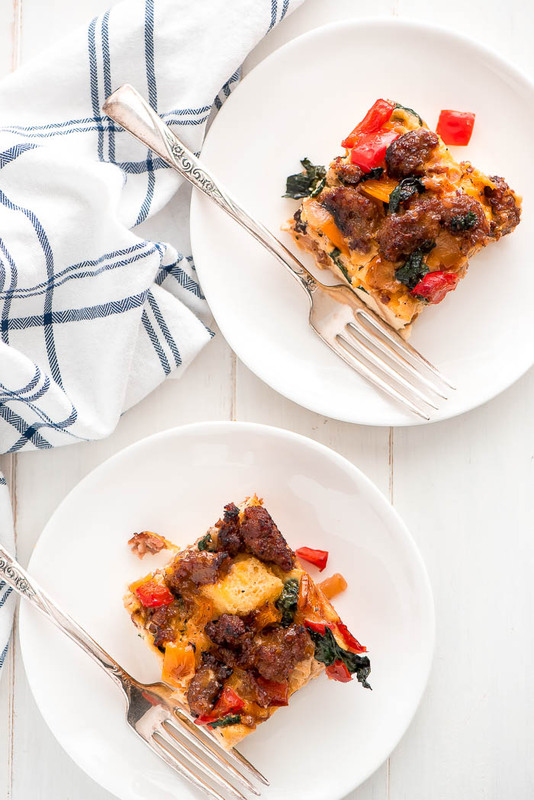 But guys, this Egg and Sausage Breakfast Casserole is the bomb! Like, my husband and I ate this whole thing in less than 24 hours. So good! You will not let any of it go to waste. In fact, you’ll be encouraging your kids to eat the sugary cereal so that there is more casserole for you. 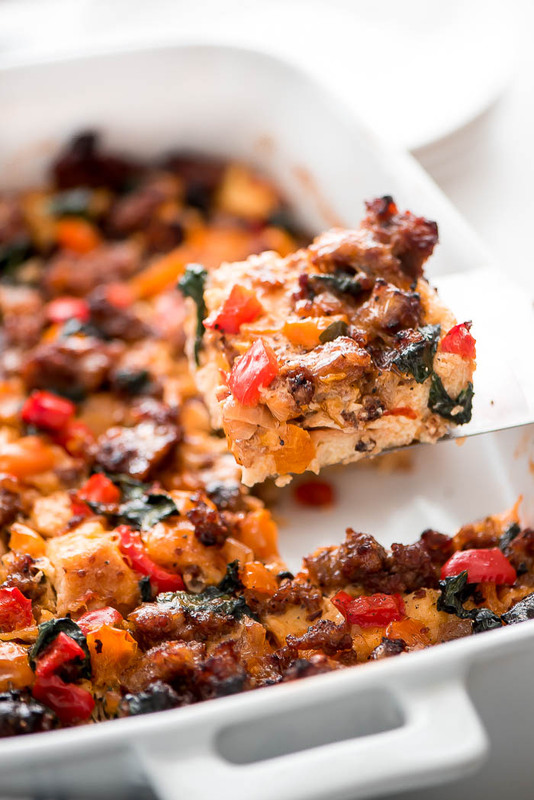 While this is a “breakfast” casserole, you can totally make it for dinner. That’s what we did and then we at the leftovers in the morning. I’ll gladly eat dinner for breakfast or breakfast for dinner if this is what’s on the menu. 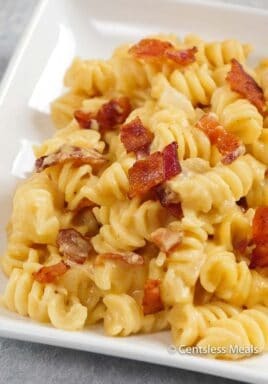 So, what is so fantastic about this recipe is that you make it ahead of time. No one likes to wake up and have to cook a big breakfast and clean all the dishes that come with it. 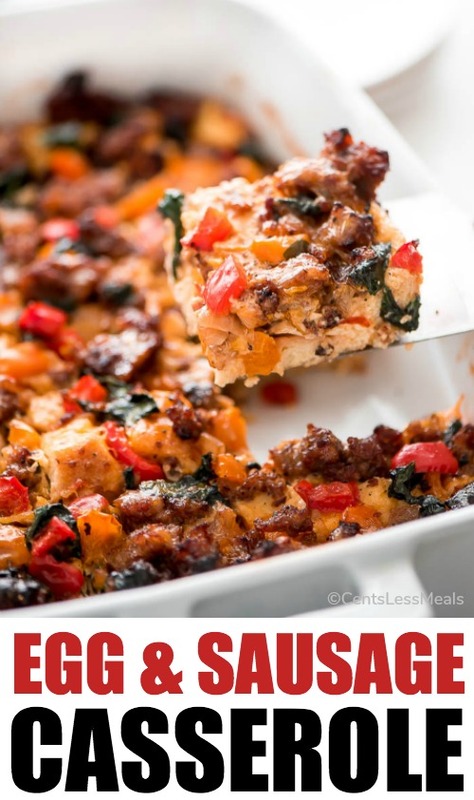 A make-ahead/over-night recipe is crucial, especially for holidays. Prep this the night before, clean up the kitchen, and in the morning all you do is uncover the dish and pop it in the oven. A delicious hot breakfast is ready to eat and your kitchen is still clean! Double win! Don’t think that because this has to be prepared in advance it’s complicated. It’s not! You’ll start out by cubing some Italian bread and placing it in the bottom of a greased pan. 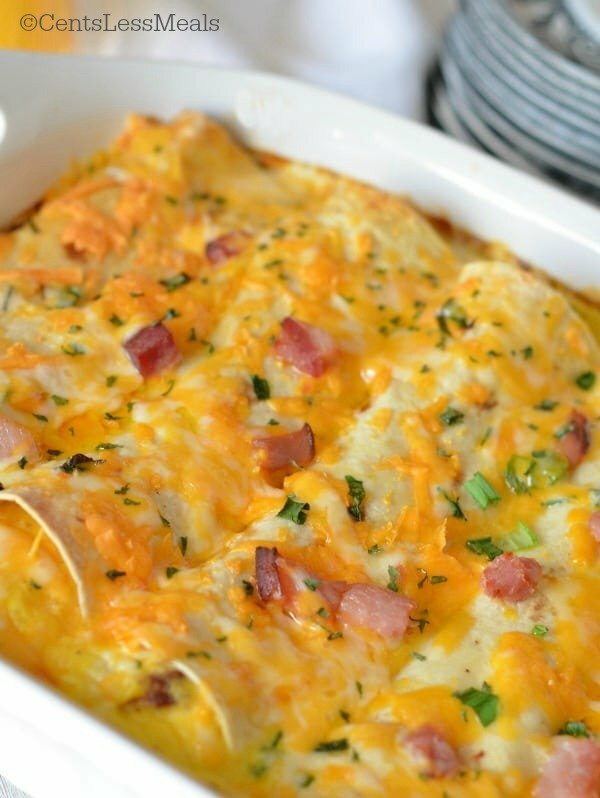 Then you whisk up the eggs with some milk, spices, and cheese and pour half of it over the bread so that the bread can soak everything up. Then just brown the sausage and cook down the veggies until soft. 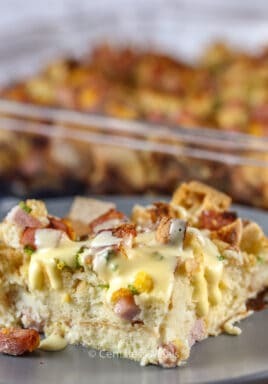 Dump them on top of the bread cubes, pour the remaining egg mixture on top, and pop it in the fridge. Easy peasy! 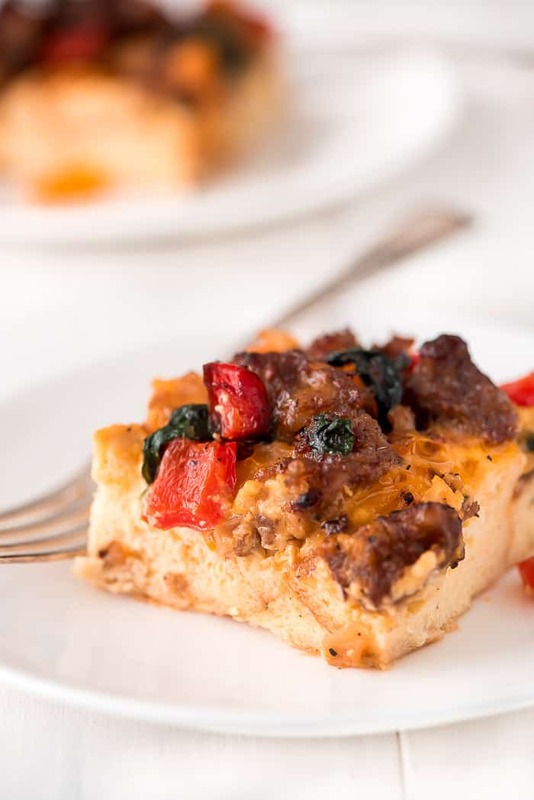 What’s also nice about this Egg and Sausage Breakfast Casserole is that you can adapt it. 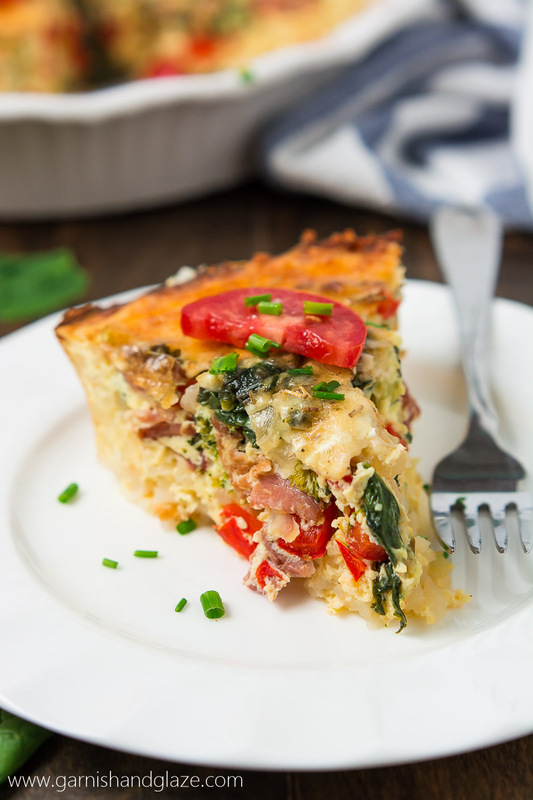 You can leave out the cheese, substitute a different kind of cheese, use ham instead of sausage, use different kinds of vegetables… Make it how you want it. 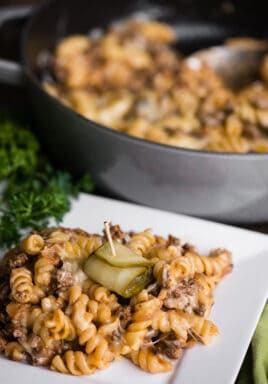 It’s a great way to use up any veggies you have hanging around in your fridge but if veggies aren’t your thing, leave them out entirely! Enjoy! Brown the sausage over medium-high heat. Remove from pan and add the oil, bell peppers, and onion. Cook for 5-7 minutes until tender. Add the spinach and cook until wilted. Mix in the sausage. Set aside. Grease a 9x13 inch pan and place bread cubes in the bottom. In a mixing bowl, whisk the eggs and then mix in the milk, mustard, salt, and pepper. Stir in the cheese. Pour half of the mixture evenly over the bread. 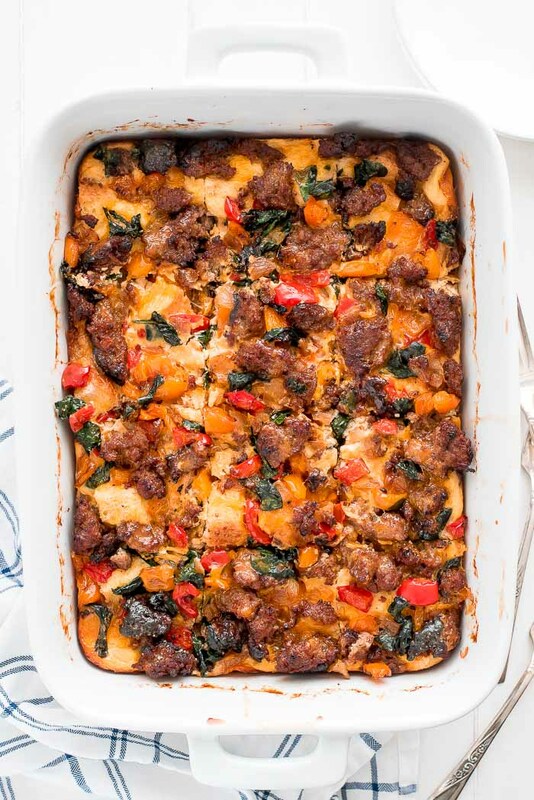 Layer the sausage and vegetable mixture on top of the bread and then pour remaining egg mixture on top. Cover with plastic wrap and let refrigerate for 2 hours or overnight. Bake at 350 degrees for 35 minutes uncovered. If it is browning too much on top, gently drape with foil and cook 10-15 more minutes or until a knife inserted comes out clean. Let cool 10 minutes before slicing and serving.